I’m glad you’re here and watching this video. I want to teach you some great tips about money, which I wish were actually taught in school but aren’t. I actually got an award for this video from GoBanking and wanted to share it with you! Let’s look at when you earn a dollar—what should you do with that money? First off, the government will take about a third of that dollar for taxes. So what should you do with the remaining money you have left? It’s simple: think of putting your money into three different jars. Your first jar is what you should call your retirement account. Remembering that the first third of that dollar goes to taxes, there’s a way you can save money before the government takes that chunk of your dollar. Take out a dime, that’s all, just a dime of that one dollar and put it in your retirement account. This account is called a 401k plan or an IRA account. You can put money into this account before taxes are taken out, allowing you to save more of your money. Do this for the rest of your life, automatically. Do not got buy a lottery ticket. This is not the way to financial security! Sadly, most Americans save less than 3 cents a day. So start out now, when you’re young and get your first job. Saving a dime out of every dollar, for the rest of your life will allow you to live and finish rich! If you’re starting out a later doing this plan, you’ll have to save more than a dime, but make it automatic no matter what. In that second jar, I want you to think of this a security, or what my grandmother used to call her “rainy day account.” You need to have an account for emergency situations. How much should you put into this security jar? Out of that one dollar, all you need to put here is one nickel, just 5 cents! And then, do not touch that money so when a rainy day comes, you’ll be just fine. An emergency might be if you lose your job, not buying a brand new car when your old one works just fine. Lastly, I want you to think of this third jar as your dream account. This is the fun jar! Since you’re young and just starting out, you’ve got time between now and when you retire from working. And you likely have a lot of great dreams! How do you make those dreams come true? You save and then pay for them by putting money into this jar, which we call an investment account. This investment account could be a mutual fund, for example. It’s an account that you’re not going to spend, until you’re ready to fund that dream of yours. So, if that dream is two years from now, or 20 years from now, you make those dreams real by buying them. Put a nickel in this jar, and your dreams will happen. You have three jars and one dollar. Put a dime of that dollar into your retirement account, a nickel into your emergency account, and a nickel in your dream account. Then, make all of these places to save automatic! That way all three jars get full, without discipline or budgeting. By doing this, you’ve taken care of yourself financially, for the rest of your life! I wish they taught this in school, but they don’t. But now you know what to do, so do it! Do me a favor, share this video with your friends because these simple lessons could change their lives forever. I hope this video helped you, and I’d love to know what you think! Send me your feedback, and I’ll likely make some more videos! 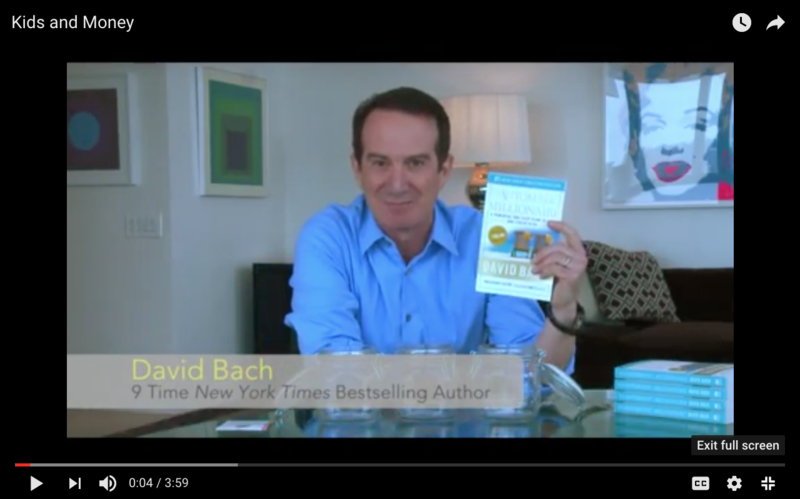 My name is David Bach, and thanks again for watching.